Turtle Cookies rolled in mini chocolate chips and pecans then filled with creamy, silky caramel and drizzled with chocolate for triple chocolate heaven! 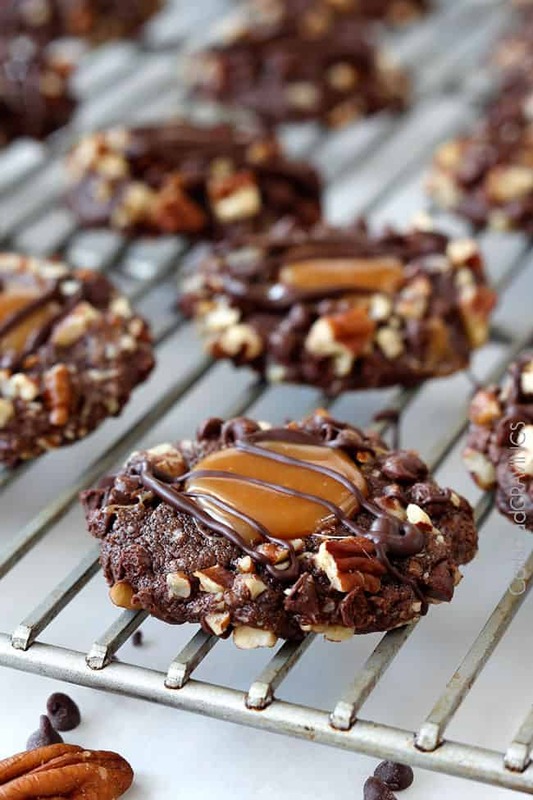 This Turtle Cookies Recipe looks super impressive but is actually super easy to make! They are mega soft, decadently chocolaty and about to become your new favorite cookie! Turtle…it’s a powerful word. It might even lead to love. One of the first times Patrick and I hung out, I casually invited him to see the new movie Pride and Prejudice (2005). When he showed up to the theater, he was met by my best friend, two of my roommates, my sister, my best friend’s mom, and my mom. As the lights dimmed and Jane Austin’s classic came to life, he sunk deep into his chair and wondered what he had gotten himself into…until all was made right with a simple offering of “turtle?” (aka a chocolate covered pecan caramel cluster) Although he didn’t know what a turtle was, he bravely accepted. We were married 4 months later. So what exactly are Turtle Cookies you might ask? Turtle Cookies are the delectable Turtle chocolates Patrick and I bonded over in cookie form. They are chocolate cookie dough rolled in chopped pecans then filled with luscious caramel then drizzled with melted chocolate. In this Turtle Cookie recipe, I transform them into triple chocolate Turtle Cookies by also rolling the dough in mini chocolate chips. Because more chocolate = more YUM. Now we can devour these Turtle Cookies in the privacy of our own home without sharing with my best friend, my roommate, my sister…and that’s a relief because it is very hard to share these ridiculously addicting cookies. I made them New Year’s Day and had to exercise all my self control to save them for our guests. Usually cookies don’t call to me that much but these Turtle Cookies scream to me! 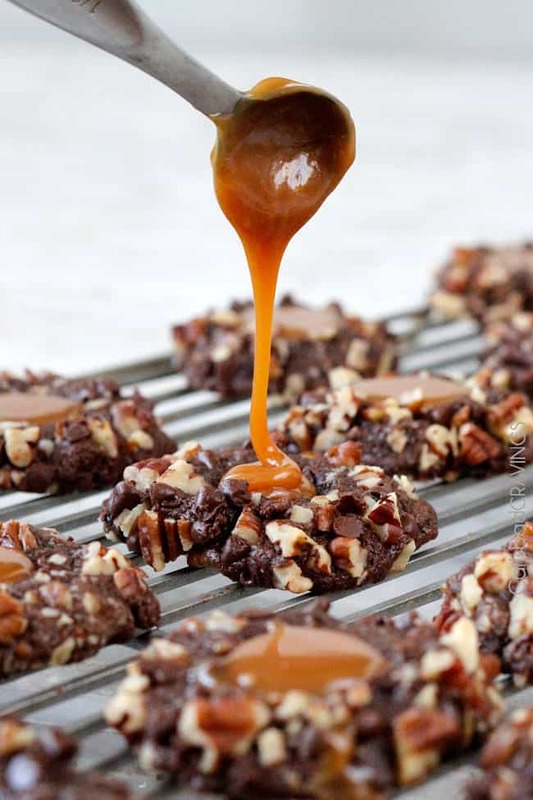 After all, their chocolate dough is rolled in mini chocolate chips and pecans then filled with luscious caramel then drizzled with more chocolate. Scream away. Turtle Cookies are very simple to make. Firsts, you will mix the dry ingredients together of flour, cocoa, and salt and then you will cream the butter, granulated sugar and brown sugar together. I use both granulated sugar and brown sugar because granulated sugar does the sugar thing and makes them sweet while brown sugar imparts a slight molasses flavor and and makes them soft and chewier. Once you’ve creamed the butter and sugars together, you’ll add the eggs, milk, molasses and vanilla. Next, reduce speed to low so the dry ingredients don’t fly all over the counter then add flour and mix just combined. Next, we chill the dough for 2 hours. Chilling is essential otherwise the dough will be too sticky to form into balls and you’ll end up with cookie dough all over your hands. Chilling also prevents the Turtle Cookies from spreading too much when baked which is essential to create our thumbprint of caramel. Once the dough has chilled, we form cookie balls then roll them into a mixture of mini chocolate chips and pecan pieces. Make sure you press the chocolate chips and pecans into the dough so they stick when the cookie dough spreads in the oven. To make the thumbprint, use the back of a 1/2 teaspoon and press lightly into the center of each dough ball. I like using a measuring spoon because it creates uniform thumbprints. After the cookies bake, the thumbprint will puff slightly, so use the same teaspoon to gently re-press the indentation. 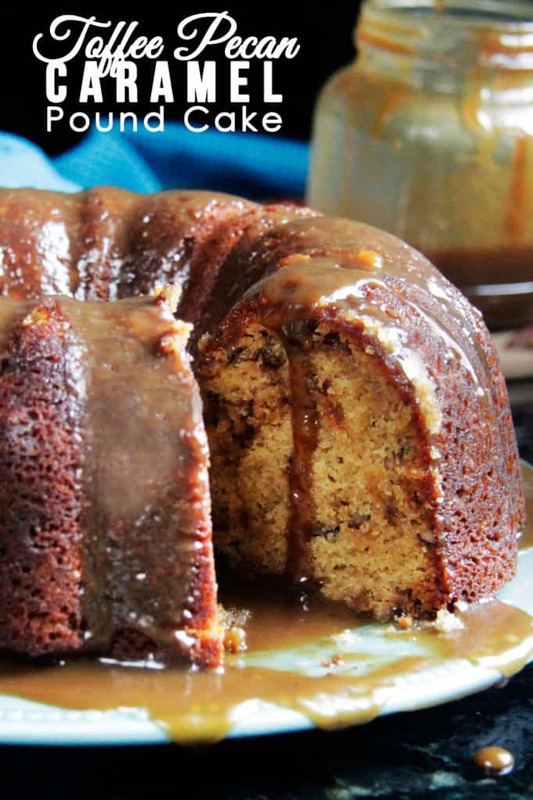 The caramel filling is made by microwaving caramels and cream together in the microwave. I use Kraft soft caramels. They can be found in the candy section of your grocery store. Finally, melt your chocolate in the microwave and drizzle away! 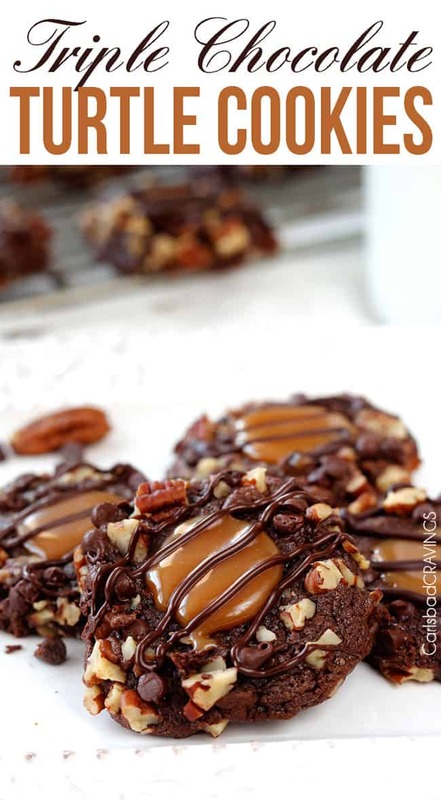 Now I realize you have probably made resolutions about eating healthier and I should be posting a salad recipe (that’s coming) but I am too in love with these Triple Chocolate Turtle Cookies to not share them right now. And you will be too. Love at first bite. HOW DO I STORE TURTLE COOKIES? Turtle Cookies should be be stored in a airtight container. Make sure the cookies are completely cool, then place parchment paper in between the layers of cookies. Turtle Cookies can be stored at room temperature for up to 7 days. Does the Caramel Stay Soft? 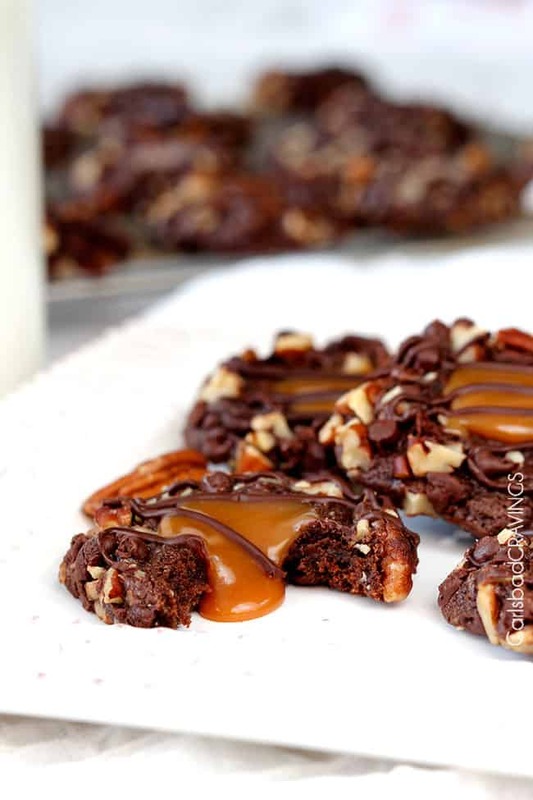 If you use Kraft caramels and follow the recipe, then the caramel will set but it will stay silky, creamy soft so these Turtle Cookies are every bit as delicious days after they were made as they were fresh out of the oven. CAN I FREEZE TURTLE COOKIES? Yes, you can freeze Turtle Cookies before or after you fill them with caramel but I find it best to fill them with caramel after. 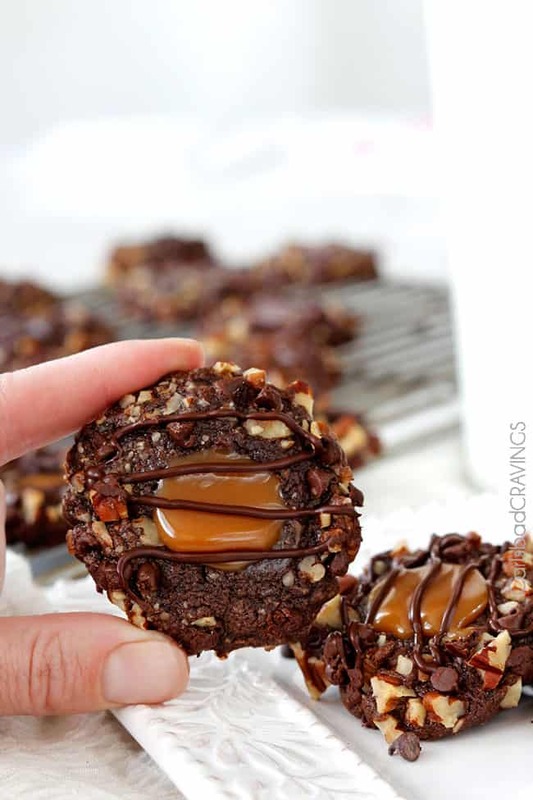 Bake cookies and and fill with caramel per instructions but do not drizzle with chocolate. Fit as many COOLED baked Turtle Cookies on a parchment/nonstick mat lined baking sheet without touching. Transfer to a freezer size plastic bag and squeeze out excess air in order to prevent freezer burn. When ready to eat, remove the cookies from the bag and let them come to room temperature on the counter. This will prevent condensation. Drizzle with chocolate and serve. Can you Freeze Turtle Cookie Dough? Yes, you can freeze the Turtle Cookie dough and shape them a a later time. Transfer to a freezer size plastic bag and squeeze out excess air to prevent freeze burn. Defrost cookie dough in the refrigerator then proceed to shape, bake an fill cookies per recipe instructions. Turtle Cookies rolled in mini chocolate chips and pecans then filled with creamy, silky caramel and drizzled with chocolate for triple chocolate heaven! 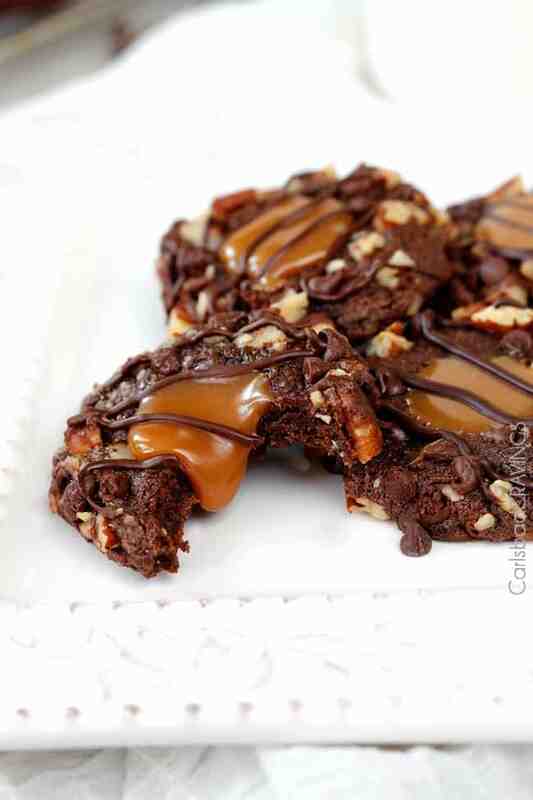 This Turtle Cookies Recipe looks super impressive but is actually super easy to make! In a large bowl, mix together flour, cocoa, and salt; set aside. In a hand or stand mixer, beat butter until creamy, add sugars and beat until light and fluffy, about 2 minutes. Add egg, milk, molasses, and vanilla; mix until incorporated. Reduce speed to low and add flour mixture until just combined. Preheat oven to 350F degrees. Line baking sheets with nonslip mats or parchment; set aside. 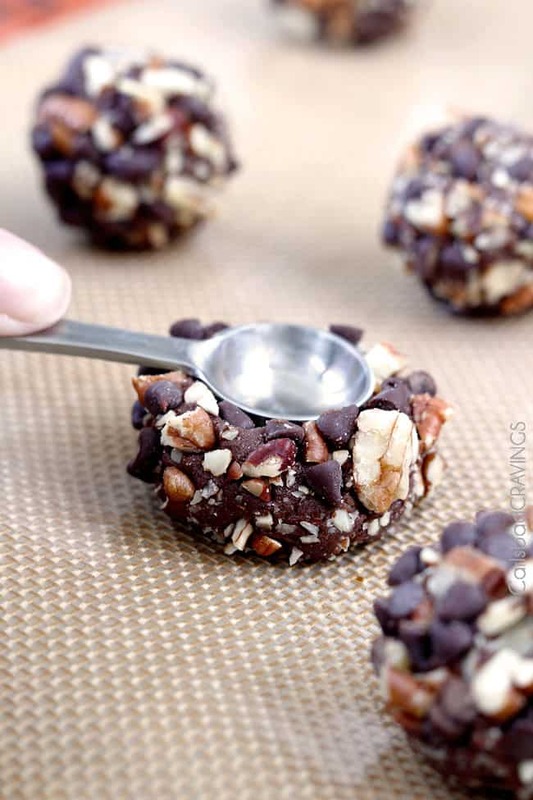 Mix together the mini chocolate chips and pecan pieces in a small bowl. 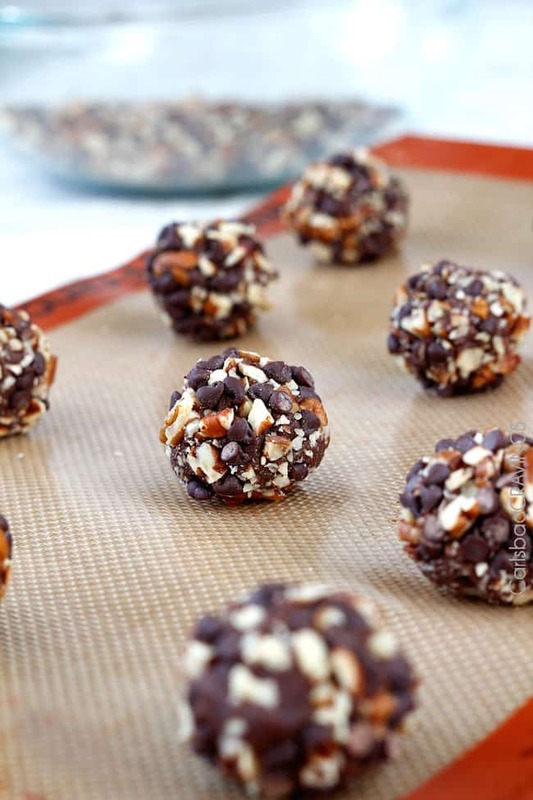 Roll chilled dough into 1-inch balls, then roll in chocolate chips/pecans, pressing them firmly into the dough. Place 10 balls per baking sheet (it makes a total of 30 cookies) about 2 inches apart. Using a 1/2 teaspoon measuring spoon, make a slight indentation in the center of each dough ball. Bake for 10 minutes then let cool on the pan for 10 minutes before transferring to cooling rack. Once cookies are transferred to rack, gently re-press the indentations. While cookies are cooling, prepare the caramel filling by microwaving caramels and cream together in a small bowl until smooth, stirring every 30 seconds until melted, about 1-2 minutes. Fill each indentation with about 1/2 teaspoon of the caramel. To make the Chocolate Drizzle, microwave chocolate in a small bowl on 50% power, stirring every 30 seconds until melted. Stir in shortening. Transfer chocolate to a Ziploc bag, snip off a small corner and drizzle over cookies. Want to try this Turtle Cookies Recipe? 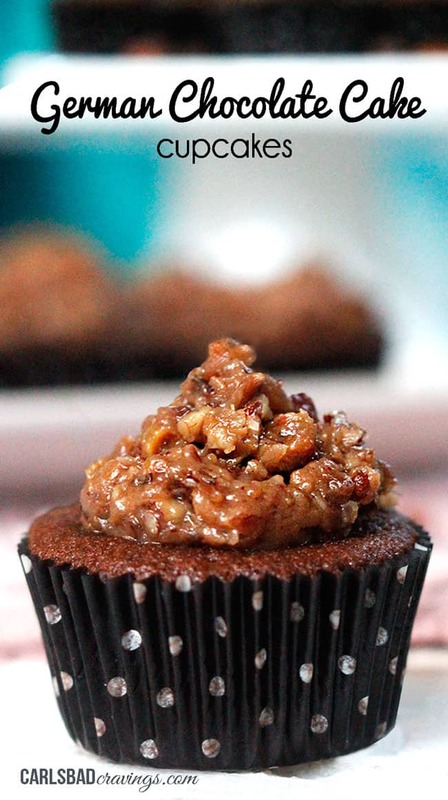 Pin it to your CHOCOLATE, COOKIES or DESSERT BOARD to SAVE for later! Thanks so much June! 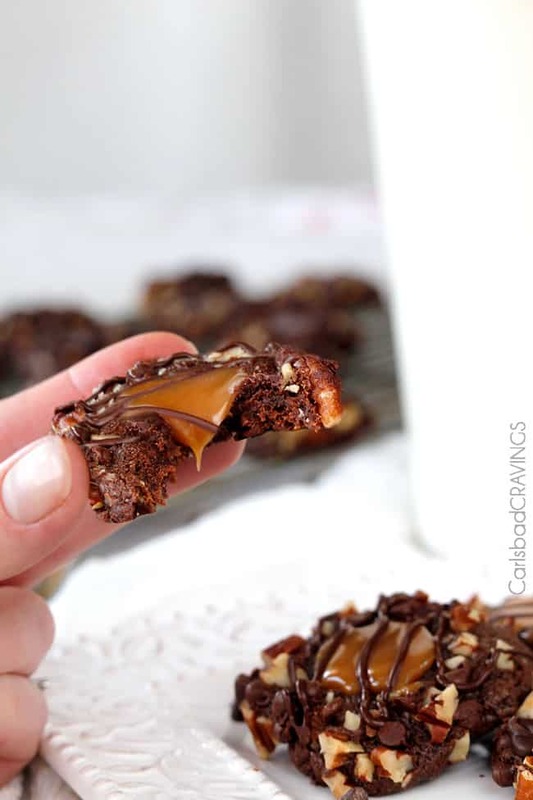 The are little bites of chocolate caramel heaven 🙂 I hope you are able to make them and enjoy them soon! Heaven is an understatement. These are beyond heaven. Hi Karen, I am so happy to hear you loved the cookies! As far as the dough being sticky, it needs to be sticky for the chocolate/nuts to adhere but it shouldn’t be THAT sticky! I would suggest dusting your hands with flour or spraying you hands them with nonstick cooking spray. I do this when I’m working with sticky bread dough. Also make sure the butter is room temperature and not completely soft. Hope that helps!! These cookies are soooo good!! Only change I made — my son has a nut allergy, so I substituted pretzel pieces for nuts, and the salty crunch of the pretzels was perfect with the caramel and chocolate! Thank you for this recipe. Hi Vicki, that is absolutely brilliant to substitute pretzels for the nuts! I might have to make a version just with that change! So happy you enjoyed them! Merry Christmas and Happy Holidays! Hi Pam! I would substitute pure maple syrup if you have it otherwise honey should be just fine. Enjoy! I so want to make these, but what about gluten free recipe? I don’t want to mess up a good thing if I use the wrong kind of “flour”. Hi there! Unfortunately, I don’t specialize in gluten free cooking/baking but I have heard Bob’s Red Mills 1 to 1 flour is a good one. Good luck! You are so on top of things! The caramel won’t be as soft but they can be frozen. Can I make the dough ahead of time? Let’s say about 3 days before time to bake? I thought maybe I could freeze the dough and thaw out the day I get ready to bake. Thoughts? Yes, you can definitely make the dough ahead of time, enjoy!